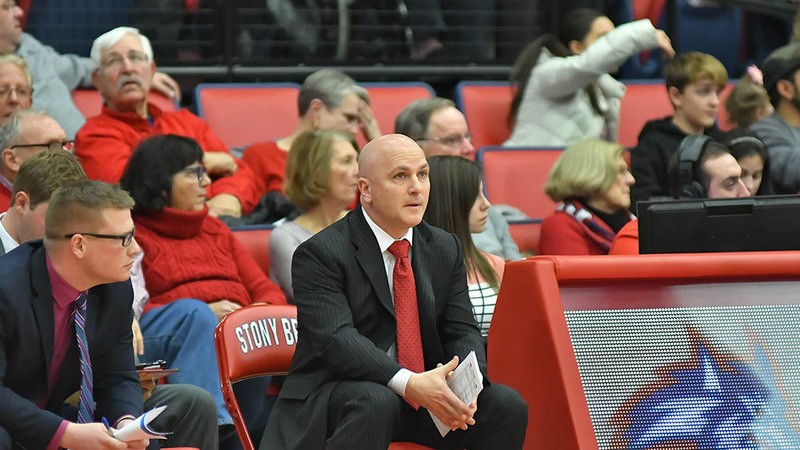 In front of a crowd packed with students, reporters, players and fans at Island Federal Credit Union Arena, Stony Brook Men’s Basketball new head coach, Geno Ford, held his introductory press conference on Tuesday, April 2. Both Director of Athletics Shawn Heilbron and University President Samuel L. Stanley Jr. also spoke, offering their full support behind the Seawolves’ fourth head coach in Division I history. Ford, who went 68-37 with two MAC regular season titles as the head coach of Kent State from 2008 to 2011, joined Stony Brook’s staff in 2016 at the request of former college teammate and predecessor Jeff Boals. During his tenure as the Seawolves’ assistant head coach, Ford developed genuine relationships with players and became known for his role as a teacher and a mentor. Ford will now have to gameplan with one less man on his roster. Sophomore guard Corry Long announced his intent to transfer on Twitter, citing a desire to continue his academic and athletic career elsewhere. Long saw limited action during the 2018-2019 season, appearing in 26 games but averaging only 5.8 minutes per contest. Long’s only career start for the Seawolves came during the loss to South Florida in the first round of the College Basketball Invitational.